A family who escaped the Grenfell Tower fire have been told by their local authority they will be moved on to a general council house waiting list. 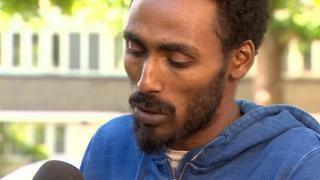 A legal letter sent to Mahad Egal and Jamie Murray, who have two children, said a programme to buy permanent homes for survivors "has finished". The couple had previously rejected a permanent home as they say it triggered memories of the fire. Kensington and Chelsea Council says it is "doing all we can" for survivors. Grenfell households were "automatically allocated a place at the top of our general housing register", it added, saying support for survivors continued through dedicated officers and the Grenfell rehousing programme was "still ongoing". Earlier this week, the couple told the BBC they faced removal from their temporary home because Kensington and Chelsea Council had said it was "no longer suitable" and would not renew it. The council has now said they will be able to remain there. Mr Egal told the BBC's Victoria Derbyshire programme that the council was "relinquishing its duty" towards them. "It's shameful. There's a lack of understanding, lack of communication and lack of humanity," he continued. The council said in November 2017 it was "committed" to rehousing all survivors to permanent homes within 12 months - a promise reiterated by former government housing minister Alok Sharma. The council's legal letter to the couple's solicitors says that "taking into account your clients' specific requirements, there are no current permanent rehousing options available for the council to offer at this stage". It adds that any future rehousing options would be "either council or Housing Association homes", made through the waiting list - saying it was "not possible at this stage to provide a timescale" for when accommodation might be found. It also said the Acquisition Programme set up to buy permanent homes for survivors "has now finished". According to the council's website, there were 3,330 households on its waiting list in December 2018. Last year, 433 properties became available. Of these, 141 had two bedrooms. Mr Egal said there is "nothing else I can do now but wait". But, he added: "I wouldn't want to go ahead of a family [on the list] that have been waiting for years for a home." Local Labour MP Emma Dent Coad told the BBC's Victoria Derbyshire programme this week that the council saw some Grenfell survivors as "troublesome" and wanted to "clear the decks" before the second anniversary of the tragedy on 14 June. The couple were previously offered a permanent home by the council, and moved in last month. But within three weeks they had returned to their temporary accommodation. The home had been connected to a building with aluminium decorative casing around the windows. They could see this through the living room window, and said it made them feel unsafe - causing them high levels of anxiety and a worsening of PTSD symptoms - following their experiences of the fire. But the couple said they were "given similar reassurances when we lived in Grenfell Tower". Kensington and Chelsea Council said 180 Grenfell households were now in their new homes. It said it had bought 300 homes for 202 families, "spending over £200m". "There are a very small number of households that have not yet accepted a permanent home and we are continuing to support them in choosing a suitable property," it said in a statement. "These households are automatically allocated a place at the top of our general housing register and remain part of the Grenfell rehousing process."